Reducing the fat content of your favorite fried food by as much as 80% certainly sounds super appealing! This is made possible by the hot air fryer that cooks using hot air instead of hot oil. What is considered unhealthy oil fried food has now become healthy air fried food. Isn’t it amazing that you can cook food stuff without using any oil and yet you still get appetizing, tasty and delicious food? Do you agree that air frying is better than conventional frying? There are so many reasons to love the hot air fryer for home use. Diet plays a key role in your quest to losing weight. A low fat diet contains less calories. Burning more calories than you consume helps in weight loss. Consuming excess calories will result in more stored body fat and weight gain. With the air fryer, it is possible to reduce calories intake and still have your favorite fried food. A diet that has low fat, low sugar and low salt content is recommended. Eating breakfast is important if you wish to lose weight. Taking breakfast prevents overeating later in the day. However, the morning rush is typical of most working adults. You have limited time to prepare breakfast and to clean up after eating. With the air fryer, preparing breakfast is simple and fast. Throw in 2 – 3 slices of bread and in just 2 – 5 minutes, you have toasted bread for breakfast. Air fry a plate of mushrooms, ham and cheese together with an egg to go with your toasted bread in under 10 minutes. 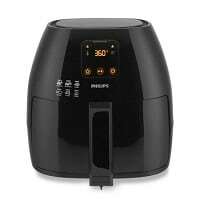 The air fryer simplifies messy deep frying, tedious grilling, baking and roasting. With hardly any mess to clean up, (Most removable parts are dishwasher safe and countertop remains clean after cooking) you’ll enjoy hassle-free cooking of your favorite comfort foods. Hot air frying involves no oil or at the most, a tablespoon of oil to get a crispier effect. In fact, the air frying machine reduces saturated fat content in food as excess oil/fat from the meat drips out during the cooking process. You’ll end up with cooked meat that has a lower fat content compared to the raw meat before cooking. French fries cooked using the multi cooker air fryer from Philips has 80% less fat compared to traditional deep frying in hot oil. Cooking raw chicken wings or roasting a whole chicken requires no additional oil added. Excess oil from the fat of the chicken drips down onto the drip pan below the cooking basket of the air fryer. The cooked chicken has less fat and less calories but still has a delicious crispy skin and moist, juicy meat. This is made possible by cooking in rapidly moving high heat in a very short time. Fats contained twice the amount of calories per gram compared to carbohydrates or protein. Excess intake of fat, especially saturated fat, will certainly lead to an increase in weight. Cutting calories is essential to lose weight and maintain it. Using an air fryer to cook low fat meals greatly helps in reducing your caloric intake every day. You are also more willing to cook for breakfast, lunch or dinner due to the ease of using the fryer. This results in healthier low fat meals every day. With home cooked meals, you’re able to control the amount of oil, salt and sugar used. 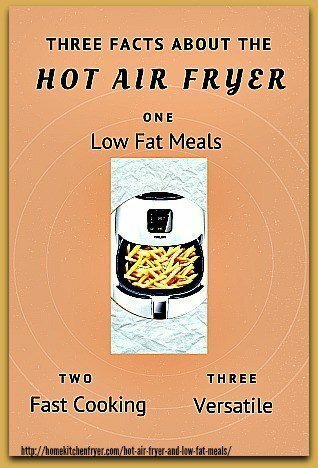 Even your teenagers can use the air fryer for their healthy low fat meals. It is safe and easy to use. Seniors would love the air fryer too. It is easy to use and certainly safer than stove cooking where they would have to work with fire and hot oil. 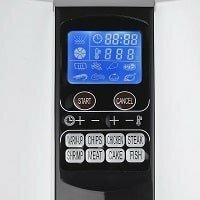 With the hot air cooker, they can easily control the fat in their meals. Due to its multiple cooking modes, the meals you can cook in the air fryer are never dull and boring. Frying, roasting, grilling, baking and steaming make the air fryer a versatile and interesting cooking appliance to use. Most important, the food is tasty and healthy. Remember, most recipes require no addition of oil. It can replace a number of your kitchen appliances. Compact and space saving, you’ll love it if you have limited kitchen space. The machine is practically hands-free. This frees you up for other chores. Of course, the number 1 reason you’ll love it is because of the many types of low fat meals you can easily cook using the versatile healthy air frying machine. Traditional comfort foods can now be cooked with less oil and faster as well, not forgetting to mention the minimum clean-up after the meal is done. Serving your family and loved ones healthy low fat meals that taste good is your goal, right? Besides using the air fryer cooker to reduce oil or fat intake, you can also try reducing saturated fat in food to control your weight. You can lose weight slowly by making small changes to the way you cook and the way you eat. Cut down on saturated fats, cut down on refined sugar, cut down on fast food as well as takeaways and include more wholegrain food in your diet. Cooking at home makes all these possible. The hot air fryer multi cooker makes doing these easier, simpler and more manageable. If you do not already own one, then you should seriously consider buying the air fryer for cooking low fat meals in your home kitchen.